We provide oil dispenser that assures free flow of oil. Manufactured from premium quality stainless steel, it has a tube that helps in easy dispense of oil. The product can be customized on parameters of capacity and designs, according to the definite demands of our esteemed clients. Clients can avail a large array of Buckets from us, which are made through quality approved metals and advanced technology tools. Under the supervision and adherence of industry heads, we have designed and developed our exclusive as per the industry standards. These Buckets are acknowledged for their high storage capacity and excellent strength. We have come up with an exclusive assortment of Steel Catering dustbin. These attractive dustbins display the admirable artistry of our designers and craftsmen. We offer these dustbins with a blend of contemporary designs and stylish look, which make it a blend of style as well as functionality. To serve lentils, popularly known as daal, the oldest form of serving has been balti's. We manufacture stainless steel hammered finished balti, which unlike riveted handles, have silver brazed handles to ensure that food safety is not compromised while dining & serving. Bakti is offered in 2 portions to suit the single & double portion sizes. 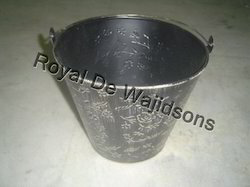 The steel buckets availed by us are sturdy and durable. 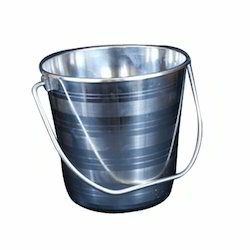 They have strong handles that aid in easy handling of steel buckets. Further they are also offered in customized ranges and designed in adherence to the preferences of our clients.